And possibly one of William Shakespeare’s rivals? Some writers such as Robert Gittings, in his tepidly received Shakespeare’s Rival (1960), suggest that Gervase Markham (1568-1637) might have been the man that Will skewered here and there in his sonnets and elsewhere. Markham may have in fact also inspired Shakespeare’s Don Adriano de Armado of “Love’s Labor Lost.” Don Armado, as you might recall, was given to high-falluting words and spoke in long paragraphs, fancying himself a pal of the king’s, when in fact the courtiers surrounding him saw nothing but a joke when they looked at him. 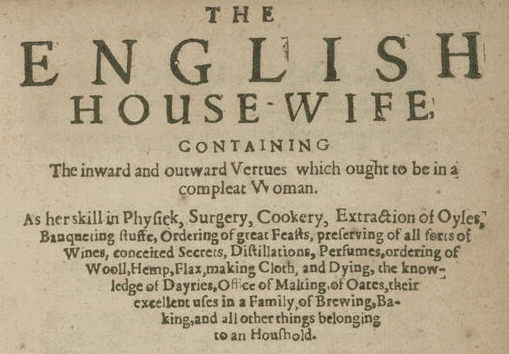 If Shakespeare indeed felt the urge to lampoon Markham, the copious output of this expert on husbandry, cookery, dairying, brewing, and other sundry subjects likely piqued Will’s jealousy. Prior to Markham, rare indeed were books on yeomanry or the skills for successful country life, The Book of St. Albans (printed in1486) being one of very few precursors. Culinary historian Karen Hess mentioned Markham often in Martha Washington’s Booke of Cookery (1981), a work based on Jane Ludwell Parke’s copy of a seventeenth-century manuscript cookbook that came to Virginia with Jane’s stepmother, Frances Culpeper, wife of Governor Sir William Berkeley, who governed Virginia from 1641-1652 and again from 1660-1677. Two of the recipes – both incomplete – interpreted by Ms. Hess concerned boiled fowl, and in this case, chicken. Markham’s treatment of chicken appears as late as the eighteenth century in Worcester in England, according to Florence White’s Good Things in England (1932), including the sippets (triangular pieces of toast). In fact, the recipe is somewhat similar to fricassees, to which Markham also devotes some ink, as well as to stewed chicken, a dish very familiar to me from my childhood, based as it was on recipes from my Southern grandmothers. Gervase Markham’s opus, so broad and so profuse, earned him the reputation of a bit of a hack in his day. His cookery book of 1615 continued to be reprinted until 1683. The lack of attention given to him when looking at early American cookery suggests the possibility that Hannah Glasse’s The Art of Cookery Made Plain and Easy (1747) was one of the only cookbooks extant in the colonies. Glasse’s book was for sale in Williamsburg, VA, as attested by advertisements in The Virginia Gazette. However, aside from Markham’s work, other cookbooks arrived in Virginia, according to fashion and the increasing presence of women’s voices in the genre. Recall, though, that at the time few women could read and write, perhaps 5-10%. Robert May’s The Accomplisht Cook appeared in 1660 and The Closet Of Sir Kenelm Digby Knight, Opened hit the booksellers stalls in 1669, very obviously usurping Markham’s work. Both merit a deeper look in the formation of cookery in the New World, as does Markham. Shakespeare need not have worried, for few now remember Gervase Markham. Which is a shame, because Markham’s work deserves more study and comparison with manuscript cookbooks of the day. * Barnabe Googe translated Four Bookes of Husbandrie, by Conrad Heresbach. This appears to be the book listed.